by the crew of the Queen Mary 2. Retired Royal Marine Mervyn Wheatley, 73, was extremely impressed by his unexpected introduction to Cunard, especially his dinner with the captain – in a borrowed tux, of course. “I may be a little less snotty about cruise ships now. I have been treated like a prince,” he said. Naturally, we’re not suggesting that our readers go to such drastic lengths to secure a seat at the captain’s table, but it’s amazing how far a taste for adventure can take you – especially at sea. This issue is packed with thrills you can experience in somewhat greater safety – from wildlife encounters to culinary challenges, and from the Canadian Rockies to the hi-tech marvels of South Korea. 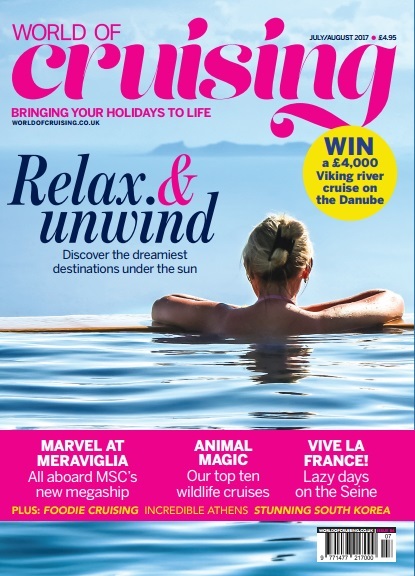 If all that whets your appetite, you’ll find lots more brilliant holiday ideas online at worldofcruising.co.uk, where you can also sign up to our newsletter.